We will not rest on our laurels and will constantly seek to strive better to provide your child with the best! 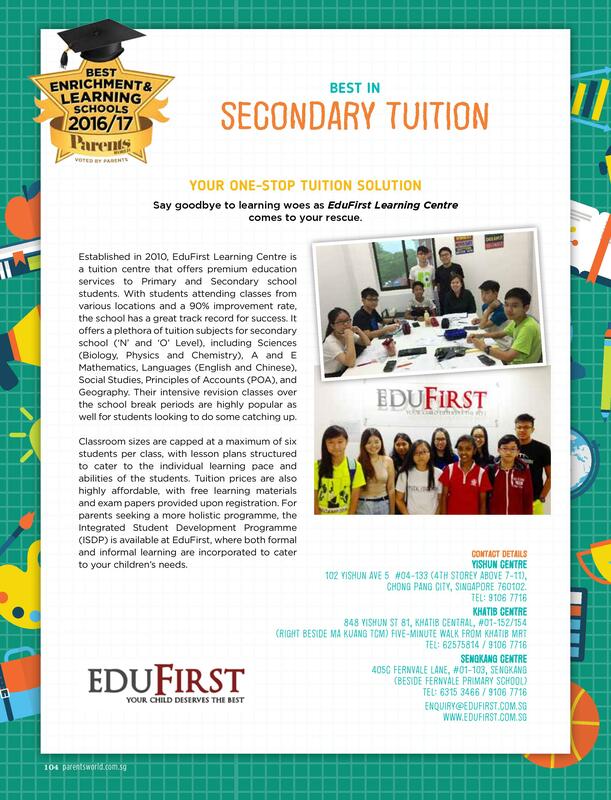 offered to Secondary School at our tuition centre, EduFirst Learning Centre. Please click on the respective links to find out more! Language learning is one of those important aspects of modern life that equip people to communicate with each other. Communication becomes transparent through efficient language learning. Secondary School Tuition Centre assists students to know the basics of English and its basic rules so that they learn the language by knowing the structure of the language in small steps that do not strain their little minds. It is necessary and compulsory EMB 3 score to get direct admission to Polytechnic foundation Programme (PFP). How to implement and motivate students to learn the unknown foreign language like English? Experienced tutors love to inspire students and they teach easy methods so that your child the right skills and techniques so that students learn to face newer challenges and demands. Small groups of students are formed such that students will receive individual attention from the English tutor. Teachers are trained to provide keen attention to child’s weakness. Teaching with a view to encourage learning with the intention of understanding basic concepts, importance of grammar and answering the quesions with the right techniques to achieve good scores in examinations.